Middle Georgia has been experiencing a hamburger renaissance which has been a major benefit for anyone who likes America’s favorite sandwich. One of the hardest decisions I’ve had lately is whether to turn left into Bearfoot Tavern or right into Ocmulgee Brew Pub. How dare they force us to make such a tough choice. I’ll get to Ocmulgee in a future post, but this one will sing the long list of praises for Bearfoot’s version of the famous shredded beef patty. The Bearfoot bar has a classic design that reminds one of an old American pub or continental brasserie. Photo by Doug Deal. 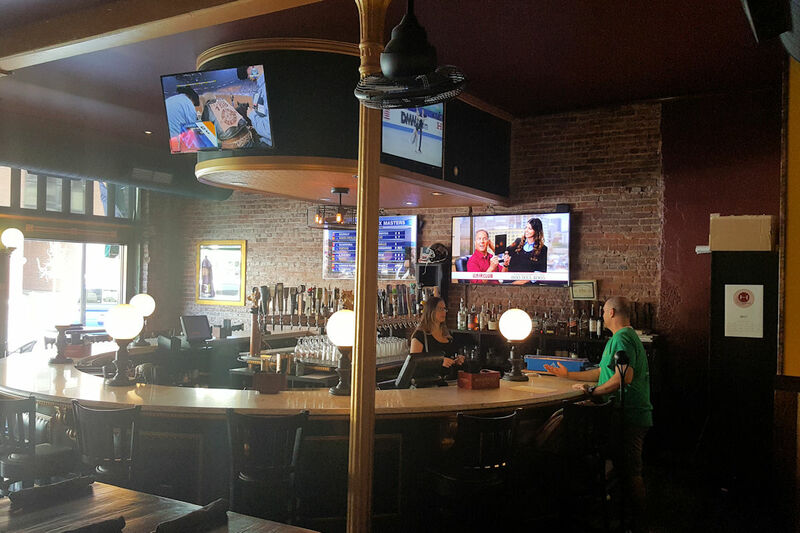 Walking into Bearfoot, the first thing you’ll notice is the classically decorated bar. 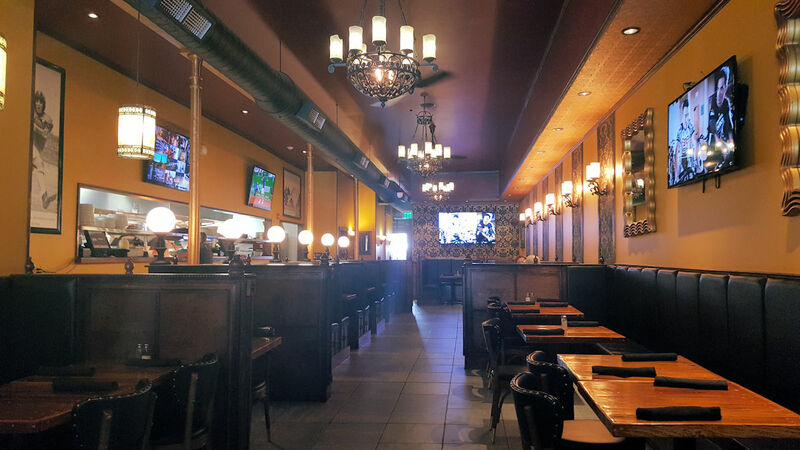 This warm and inviting area reminds me of a mix of classic American with a classic continental brasserie and is a great place to catch a bite or drink and adds a bit of class to the atmosphere. Non-drinkers and families, don’t be intimidated, this is a full-blown restaurant with an amazing menu. You really don’t want to miss their weekend brunch and their breakfast pizza which should be the talk of the town, but since we are here for burgers, we’ll leave that for another article. Bearfoot has plenty of options for seating, including a beer garden and this, the main dinning area. Photo by Doug Deal. The Hamburgers, and I capitalize that because each has a proper name, based on former and current Mercer University Presidents, are as delicious as they are varied. On one end, they have a Greek-inspired lamb burger, the Underwood, which is named after Mercer’s esteemed current President, William D. Underwood. This burger features lamb, feta tzatziki, tomato, and red onions. Toward the more traditional end is the gigantic Dowell Burger, named after Spright Dowell, Mercer President during the depression and World War two era. This meal-and-a-half is two 8oz beef patties smothered with sauteed onions, pimento cheese, and bacon and then served on Texas toast. There is a sense of irony in the name as the period he served as President was known for shortages and deprivations. However, perhaps it is an homage to the prosperous times that followed. Pinckney Pollack Burger unclothed in a bun and ordered as a double. A low carb delight. Photo by Doug Deal. 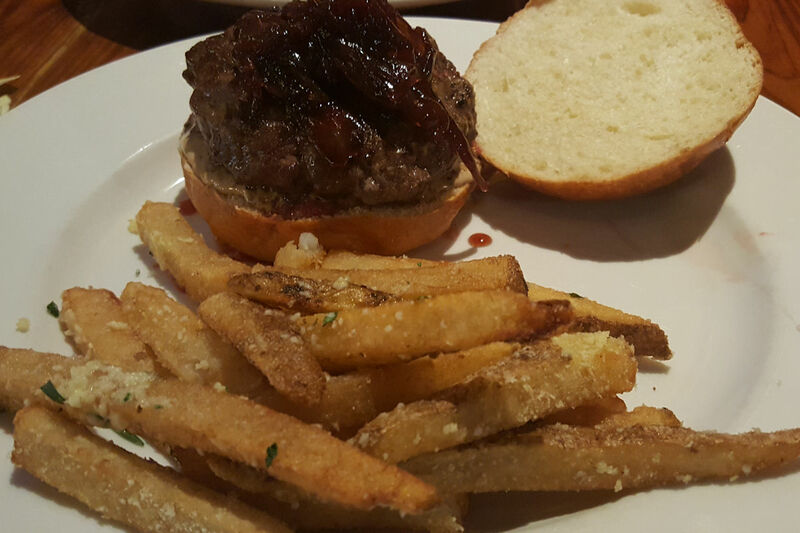 The Godsey Burger is unbelievably good with a bitter sweet taste due to the slow cooked shallots and brandy peppercorn reduction. Photo by Doug Deal. The Godsey is named after Raleigh Kirby Godsey, Mercer’s 7th President. This meaty delight is set off by the wonderful bittersweet taste of brandy peppercorn sauce melded with braised shallots. If some of the juice drips out, you’ll want to sop it up with your truffle fries which I found I could not stop eating. I am not sure who came up with the trend to put these flavorful mushrooms on fried potatoes, but that person deserves the Nebel prize in culinary arts and Bearfoots version is perfectly executed. The scrumptious pink of a Godsey Burger ordered more on the rare side. Feel free to order it cooked more well done. Photo by Doug Deal. My patty was prepared just as I ordered it, pink in the middle from end to end. Bearfoot accommodates any preference as you can char that burger to your heart’s content, but I love the juiciness a medium rare to rare has to offer. 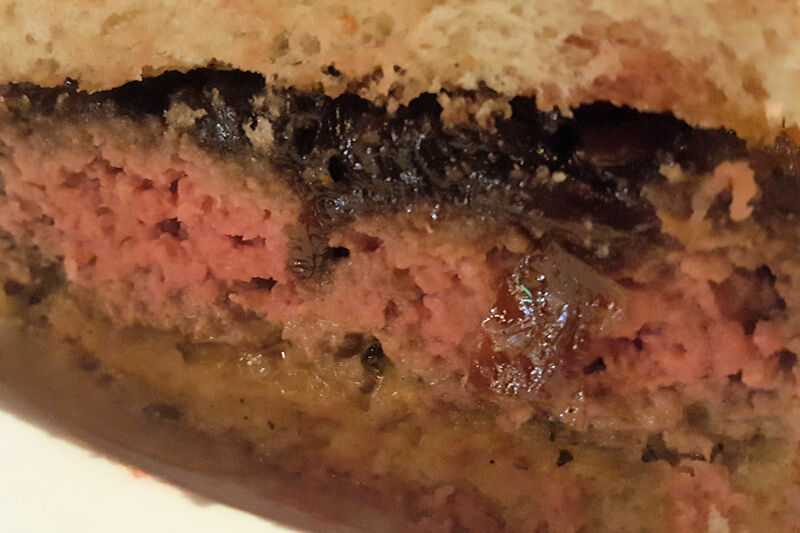 And speaking of juices, the sandwich oozed the juice of not only the wonderful brandy sauce but the moist and delightful interior of the burger itself. I go with the truffle fries, but there are other options for sides which are included with the $10 burger combo. The list includes whipped potatoes, muffuletta pasta salad, mac n cheese, tater tots, veggies and for the traditionalist, house cut fries. 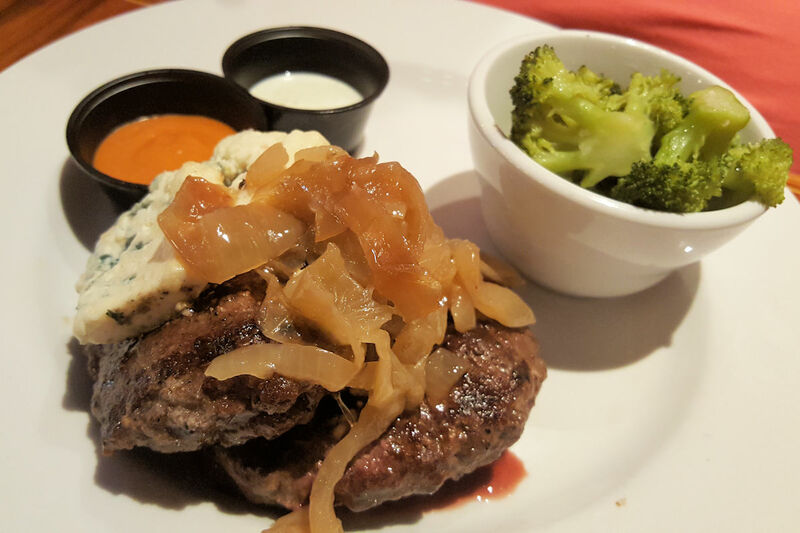 The quality of the food here raises the expectation of a higher price, but to their credit, it is still reasonable considering the ingredients and level of service. Having been several times, the knowledge and training of the staff are excellent and the customer service is top notch. If you like a great burger, give Bearfoot a try and don’t forget to sample their other fine menu items. Bearfoot is located downtown at 468 Second Street near the corner with Poplar a couple doors down from perpetually renovating Ginger. It is open from 11 AM – 10 PM Monday through Thursday, Friday and Saturday it stays open until 11 PM and on Sunday closes at 9 PM. Brunch is served 11 AM – 3 PM. Call them at 478.305.7703.